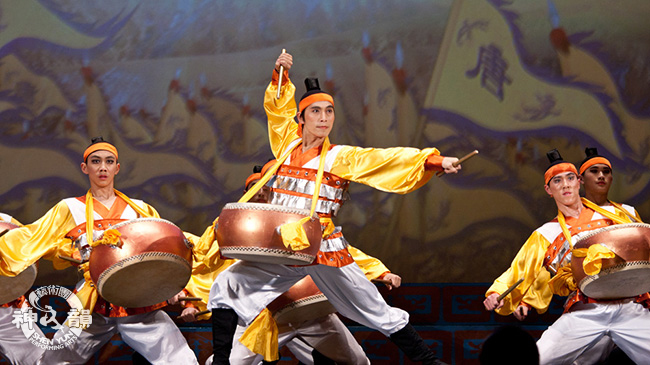 Indisputably the best Chinese dance and Chinese music production in the world — Shen Yun tours the globe each year with a completely new and original show. As lovers of China’s unique and ancient culture, we are avid Shen Yun fans. We’re reposting dancer Ben Chen’s tour blog about Chinese drum dances he’s fallen in love with. We’re with him in drum-love. More than 5,000 years ago, an epic battle took place between the great Yellow Emperor and rival chieftain Chiyou — a bronze-headed, iron-limbed God of War who ate rocks for breakfast. Helped by the Goddesses of the Nine Heavens, the Yellow Emperor constructed 80 huge battle drums from the skin of the one-legged “Kui” beast, and with thunderous drumbeats boosted his army’s morale, crushing the enemy’s spirit. It was a decisive victory for the Huaxia tribe, and to this day, Chinese people everywhere continue to identify themselves as sons and daughters of Huaxia — descendants of the great Yellow Emperor. As for the descendants of the drum, today, they come in all shape and sizes. The smallest drums can be picked up in Chinatown and shaken singlehandedly, while the bigger ones are big enough for modern Chinese dance legend Huang Doudou to complete a full circle of butterfly-kicks on top of. In the “cradle of Chinese civilization,” harsh winds sweep across the Loess Plateau in northwest China. As the distant sound of the suona nears, a ball of yellow dust looms on the plain. Inside are drummers dancing wildly and kicking dust into the air, while shaking their heads like it’s a party. They are farmers. China has been an agricultural superpower since the Yellow Emperor‘s time. During its economic prime, the Song Dynasty produced a quarter of the world’s crops. Indeed, farmers have played a major role in China. And just as the color of the soil varies across China’s diverse territories, the farmers who grow up on them have all developed their unique styles of dance. These styles are very hard to emulate… unless you become one with them. Some may deem them simple-minded, uneducated, or rustic (土 tǔ), but in their carefree movements and simple yet hearty smiles, we can perhaps glimpse the true spirit of the Chinese people. “Bearing” (yun) comes from within their bones, and that’s the beauty of it all. So we tied drums to our abs, put bandanas on our heads, and kicked up invisible dust on stage in a piece called Ansai drummers. All I remember of it now are the signature farmer head-shakes and — how could I forget — the 100 m sprints back and forth across stage. “Breathtaking choreography,” as they say. What I learned from this dance? Being a farmer is not easy. When Mother Nature bestows a bountiful harvest, farmers in Shandong Province grab their most affordable instrument and celebrate by dancing the Guzi Yangge. During one performance in the middle of a “Grizzly Bear Shaking Fur” on stage in Atlanta, I couldn’t help but notice a certain African-American member of the audience sitting in the fourth row. She was bouncing up and down in her seat and shaking her head with us. She was grooving to the music like it was RnB — can you imagine? What a sight! I almost forgot my next move. It was a delight to see that our Chinese dancing had really “moved” this particular member of the audience. What I learned? Appreciation of dance has no cultural boundaries. “An Era Begins” opened the show to reveal a grand battle scene between heavenly warriors and demons — possibly the coolest opening ever. This time, the ladies pushed the drums around the stage, played powerful beats, and executed sweeping formation changes, while the gentlemen took upon themselves the immensely difficult task of… twiddling drumsticks. My favorite moment of this dance — Lord Buddha striking the giant Red Dragon with a flash of divine lightning — also the part I never got to see, ironically, from where I was standing. My not-so-favorite part — quick-changing in total darkness from heavenly soldier to imperial court official in under 30 seconds… over 100 times! As you’ve probably figured by now, our choreographer Ms. Chen has some sort of obsession with drums. So when there was finally a drum dance he didn’t choreograph, he had to appear on a poster. Every theater we performed at had this poster hanging outside like a Chinese Mona Lisa. That shining look in his eyes — it just commands… sheer masculine beauty. When I first watched this dance at London’s Royal Festival Hall, I was overwhelmed by that same masculine beauty. I never knew a man could dance like those macho-men were dancing on stage. Oh! And the shoulder-shakes — manliest thing I ever saw! As I became totally mesmerized by the men’s powerful drumbeats and heroic movements, my head began to shake in sync with them. I didn’t even realize, until the person in front of me started doing the same thing. On that day, I admit, I was just as moved as that African-American lady in Atlanta. After joining Shen Yun three years later, I was lucky enough to be included in the Best of Shen Yun special production, and performed Tang Court Drummers alongside those macho-men at New York’s Lincoln Center and Kennedy Center in Washington, D.C.
What I learned? How to be a MAN. This is a dance that needs be experienced live. You just can’t get the same experience from watching a recording. You have to be in the same acoustic capacity as 22 thundering drums to feel those resounding booms resonating deep inside your chest. At the last Shen Yun show I watched before I joined Shen Yun, I had paid for a normal seat. But when the curtain flew up for this final piece, it seemed to have transformed into a 4D cinema seat, complete with synchronized vibrations and stereo surround sound. 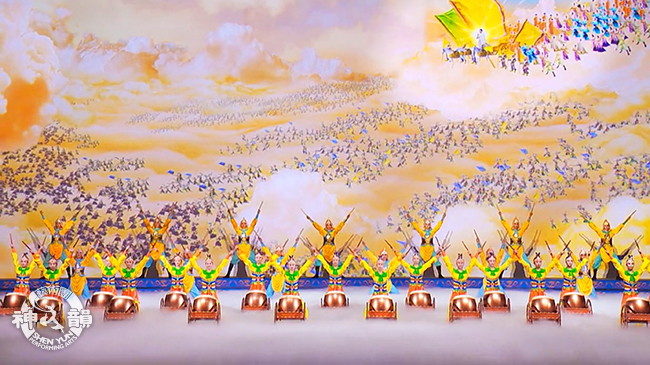 The massive drums and battle formations on stage were already an awe-inspiring sight. Simultaneously, sound waves were flooding in from every direction and drowning me. Such strong energy was radiating from the stage. I was more than inspired; I was physically shaken. 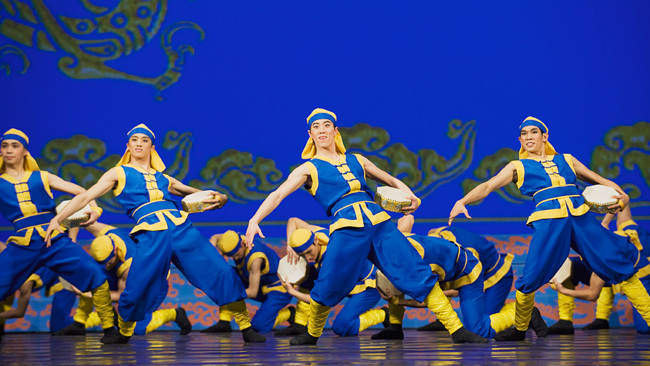 By Shen Yun’s standards today, Victory Drums might appear a little on the plain side in terms of music and movements. But it wasn’t about the score or choreography. The dance was straightforward and powerful, and struck all the right chords. Everything came full circle. The drum was brought back to its ancient, divinely inspired roots with the Yellow Emperor, and I was reminded of mine. In that moment, I learned something that could not be clearly described, something about the power of the drum, and something about the ultimate victory of traditional culture. In that moment, I think, I learned what it means to be Chinese. One month later, I auditioned to join Shen Yun. The rest is history.